A charity has received a private donation of £2.5m towards a new bridge at "one of the most spectacular historic sites in Britain". 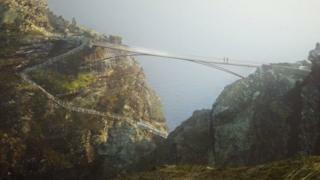 English Heritage said the sum was its largest single donation ever and would be used for the footbridge at Tintagel Castle in Cornwall. The charity launched a competition in 2015 to design the bridge. Its chairman Sir Tim Laurence called the donation from the Julia and Hans Rausing Trust an "inspiring gift". In the 12th Century, Tintagel gained literary fame when Geoffrey of Monmouth named it as the place where King Arthur was conceived. "As a charity, it is only with the support of our visitors, members and donors that we can ensure our historic landmarks continue to provide a fascinating and exciting experience to all-comers," Sir Tim said. The bridge, designed by Ney & Partners and William Matthews Associates Architectural Practice, will be set 187ft (57m) above sea level. English Heritage said it would help people "better understand" the castle, improve access, and help to preserve and conserve its archaeology and ecology. The castle welcomes about 250,000 visitors each year. The bridge will consist of two independent cantilevers of about 98ft (30m) in length that reach out and almost touch in the middle. About 1,000 members of the public have also donated to the bridge. The Julia and Hans Rausing Trust said it was a "pleasure" to support the project. English Heritage said the bridge was already fully-funded but the donation meant the charity could invest its own funds on other sites in Cornwall and elsewhere. The bridge is due to open in the summer.